The book combines a mix of practical and emotional content - it follows the highs and lows of real life experience to help inspire readers, giving them practical information to help them discover their true purpose in life, and the confidence to go and pursue it. Bernardo has very unique insight into the flaws of the 'personal development' world that so many are benefiting from. Bernardo too read a book that inspired him and now has very unique insight into the flaws of ‘personal development’ world that so many are benefiting from. There are 6 chapters in total, and an Introduction which sets out my manifesto. You. Building You Up. A Better You. Bernardo Moya is an editor, author, publisher, TV producer, editor-in-chief of The Best You magazine, and CEO of NLP Life Training (the world’s largest Neuro-Linguistic Programming organisation). Bernardo Moya has been an entrepreneur for over thirty years, author, speaker, publisher, TV producer and seminar promoter. Bernardo is the founder of the global brand The Best You and The Best You Legacy Clubs. He has unrivalled experience in the world of self-help. He is the architect behind the UK’s biggest annual personal and professional development event – The Best You Expo – held in London and California. He’s a regular, straightforward no BS kind of guy. Learn the art of bouncing back when the way ahead looked impossible. Discover how to make yourself a new and be the person you always dreamed of being. Make that paradigm shift in your life that will take you to a whole new place. What Will The Question Give You? We’ve all come to roadblocks that are challenging, frustrating and overwhelming. How can you examine your life more closely and think about what you can do to realise your fullest potential and be helpful to others? Ask the right question and recharge your life. We Need a New Approach! The Question challenges each of us to be engaged with issues facing the world today-whatever your position may be. While thought-provoking, it is intended to highlight the way to becoming the BEST YOU possible. 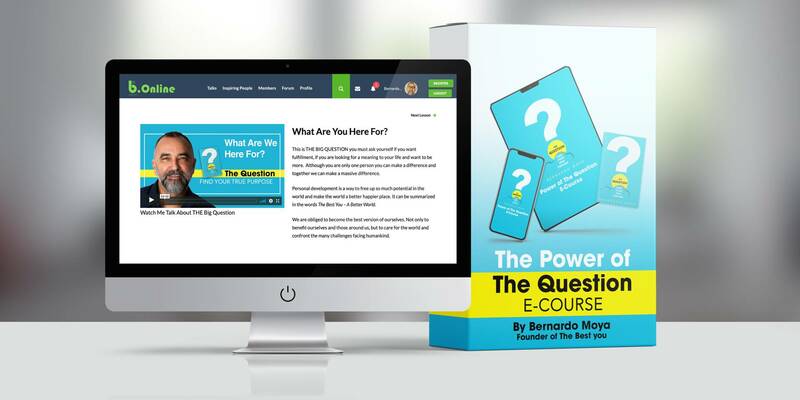 Having health birthed Chicken Soup, Mars and Venus, The Answer, The SECRET my pleasure to encourage those readers to acquire my mentor BERNARDO’s great work THE QUESTION defines the final work of growth. Asking the one right QUESTION and now you will ….. Question everything. This book offers a treasure map to discover anything one could want from life and business. Bernardo Moya has been a student, promoter of my work, and a friend for over a decade. This book offers his view of how people change for the better. This unique view provides the reader a simple way to redefine their life, find more success, and get purpose in living. "Judge a man by his questions rather than his answers", is a famous expression from Voltaire. 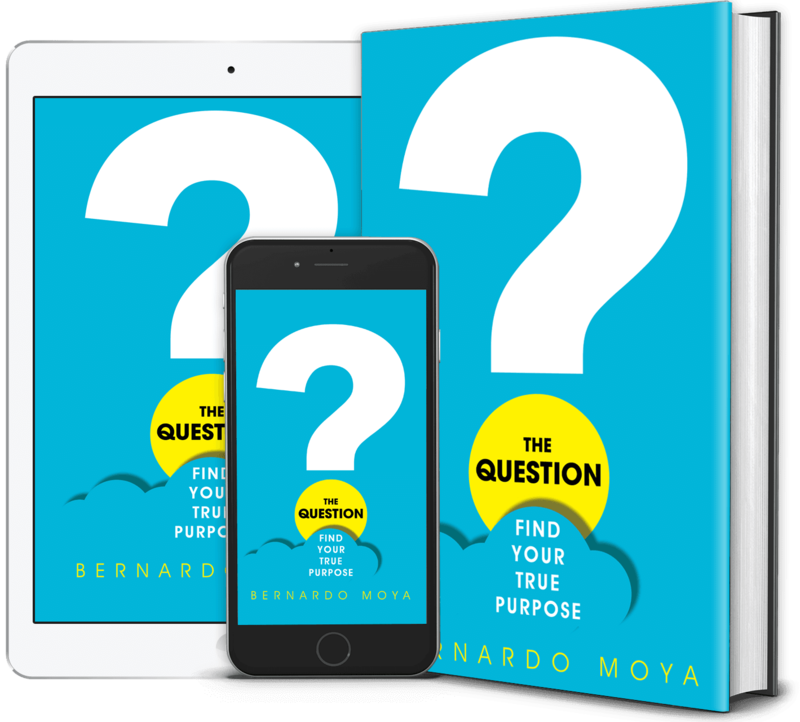 In his book, Bernardo Moya brings the wisdom of questions that the world needs to answer and act upon and for all of us to explore, in order to leave a legacy before we end our journey on this planet. The Question can give you the confidence to focus on doing something positive rather than letting life pass you by.